In pre-historic times a deep cleft in the chalky cliffs on the south eastern tip of England, was made by the River Dour around which the town of Dover developed. As the nearest crossing point to the European Continent, Dover became of strategic importance. Julius Caesar paid a brief visit on 25 August 55BC and in 43 AD, the Romans returned to build a great harbour on the then wide River Dour estuary. Unearthed groyns, quays and hawser rings suggest that their harbour was within the area of what are now King Street, Castle Street, Russell Street and St James Street. During the five centuries of Roman occupation, the Dour estuary changed with two distinct streams forming, the East and West Brook. At that time, Eastbrook offered the best course to the sea and below Warden Down, the cliff behind the present Sports Centre, a new harbour was formed. The Westbrook entered the sea just beyond where Mill Lane is today. In between, on a delta of dry land called Stembrook, was the town’s shipbuilding industry. By the time that William I (1066-1087) invaded England in 1066, the Eastbrook harbour was of national importance and he made a grant to the town’s Burgesses to ensure the continuation of their services. On the Westbrook, it was said that the King’s half brother, Odo, Earl of Kent (c1030-1097), allowed a tidal mill to be built that eventually caused a build up of silt making Westbrook un-navigable. Over the next 300 years Eastbrook harbour proved to be a great success, with royalty, both English and foreign, using Dover as the principal port for passage to and from the Continent. However, between 1300 and 1500 there was a movement of land mass that triggered a phenomenon called the Eastward Drift – the tide sweeping round Shakespeare Cliff and depositing masses of pebbles along the shore of the bay. This, together with a cliff fall, rendered the Eastbrook harbour useless and a new harbour was eventually created at the western end of the bay. Eastbrook was abandoned but shipbuilding flourished nearby until 17th century. In the depression that had been Eastbrook harbour, seawater collected at high tide and saltpans were constructed but eventually it became marshland. The main road out of Dover eastwards was an ancient route along Dolphin Lane that survived until 2018 and was on the seaward side of Castle Street. Passing where Castle Hill House in 1760 was eventually built, and then up what became Laureston Place. Later, St James Street, seaward side of Dolphin Lane, also became a major thoroughfare. At that time, on the east side of Market Square, were stables and yards of the Antwerp Hotel, owned by Robert Walker and the towns ancient Stembrook tanyard was approximately where Pencester Court is today. In 1797, during the Napoleonic Wars (1793-1815), a military road was laid from Western Heights to the Castle, both major military establishments. The road cut across Stembrook, which but this time was marshland and used for grazing sheep. Following the Wars, the Military Road was handed over to the Dover and Deal Turnpike Trust and Humphrey Humphreys bought the tannery and the surrounding marshland. Businessmen, Edward Knocker, William Prescott (1805-1869), John Finnis, and Henry Elve (1803-1865), bought landholdings on the east side of the Dour. Humphreys’ sold his for £2,000 to the Dover Paving Commission, of which most of the promoters belonged. Independently, Edward Knocker, purchased the Castle Hill House and estate for £7,000. Evidence suggests that the money for both purchases came smuggling. Prior to the Wars many of Dover’s most esteemed businessmen ran smuggling gangs. The consortium planned to develop these landholdings, which did not require an Act of Parliament – as many such developments did in those days. Further, it helped the consortium to overcome local difficulties by the members being part of the Paving Commission that over-saw such projects! 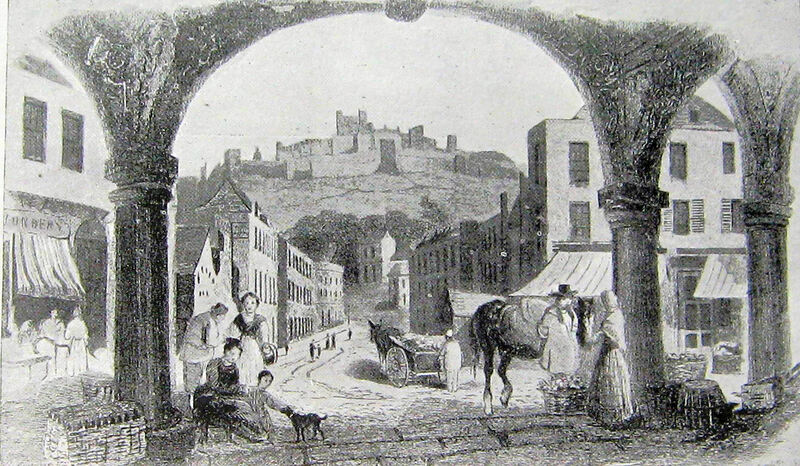 Between 1830 and 1835, Castle Street to Stembrook was formed and the River Dour was arched in 1832. 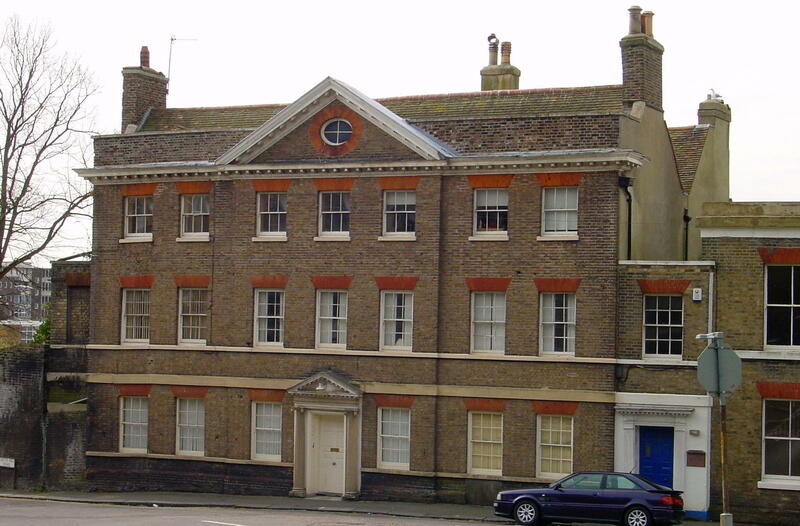 Russell Street was laid out in 1838 on land belonging to the Almshouse Charity. That Street was named after politician and Quaker, Lord John Russell (1792-1878). The archway to Leney’s soft drink plant that opened in 1910, can still be seen today. A chapel was built by the Congregationalists and opened for public worship on the 12 June 1838. Land adjacent to the ancient White Hart Inn – now Castle Inn – was sold for property development but the country was going into one of the worst depressions of the 19th century and the enterprise failed. The builder, James William Clark, landed in the Debtor’s Prison at the Castle. About 1849, possibly for health reasons, Anne Pratt (1806-1893) came to live at 39 Castle Street. One of the Victorians age best-known English botanical illustrators. This was Anne’s most prolific period writing her most popular work, the two volumes, Wild Flowers, was published in 1852 and laying the foundations for the five volume, The Flowering Plants and Ferns of Great Britain published in 1855. That year her work was acknowledged by a grant from the civil list. The carriage works of Edward Hills, 47 and 48, now 54 and 55 Castle Street, the library on the upper floor and the adjacent stables of Leney’s Phoenix Brewery nearby were destroyed by fire on January 1888. The three storeys high building was completely gutted but the horses fortunately were led to safety. The Dover Proprietary Library, a private concern, containing some six thousand books many dealing with Kent and local history were lost. The adjacent Forsters chemists (now Blakes) and butcher had their premises damaged but the soundly constructed party wall saved the recently rebuilt Dolphin Inn. It was reported that the fire was so devastating because the town’s water supply was inefficient at the time. With the emphasis on fire prevention, the coachworks were rebuilt and at the time of writing it is an upmarket gown shop. 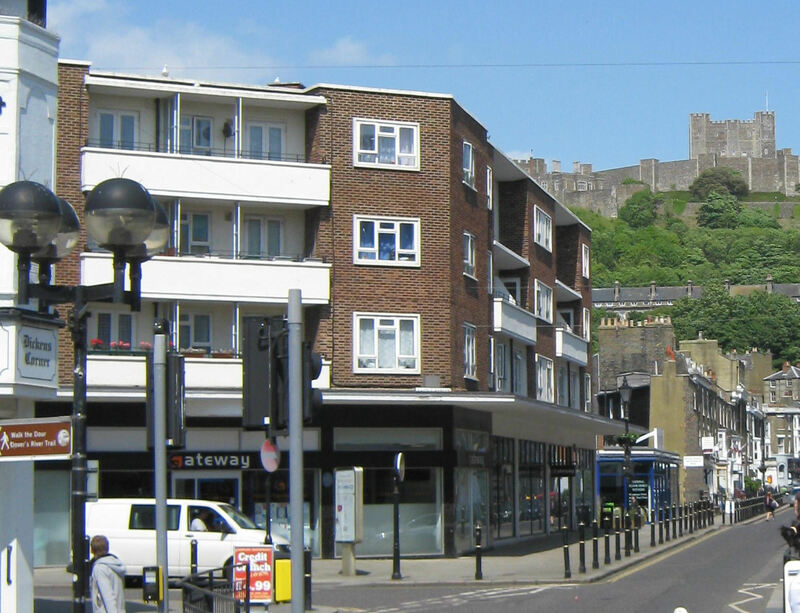 By the last quarter of the 19th century, Castle Street had become the centre of Dover’s professional district serving the town’s wealthier residents that lived between the Street and the seafront. Wollaston Knocker, Town Clerk from 1868, resided at Castle Hill House and ran the town from there. 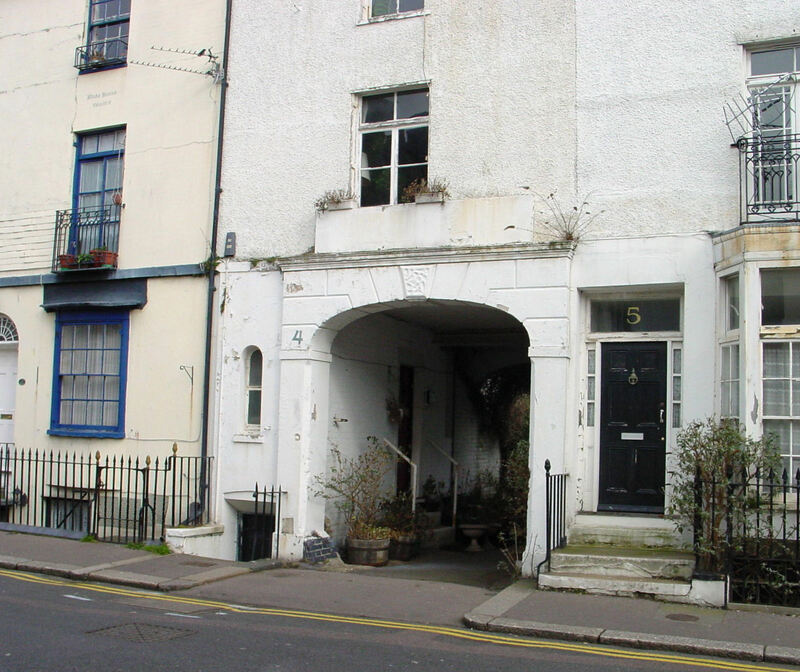 In 1894, he sold part of his land so that Woolcomber Street could be widened and make a better access to the seafront. At the same time, in order to straighten Maison Dieu Road, numbers 8 and 10 Castle Street were demolished. As a sign of the time, in 1895 what became Wright’s electrical services was established in 1895 and remained in Castle Street through three generations. Tuesday, 4 August 1914 saw the outbreak of World War I (1914-1918), air-raid drills were started immediately and shelters opened including some in the vaults of Leney’s Phoenix Brewery. Later in the War, their mineral water factory in Russell Street was completely wrecked by a bomb but was rebuilt. Throughout the War notices on front line casualties were posted at the company’s brewery offices in Castle Street, as they had been during the Boer War (1899-1902). Before the War had ended, changes were afoot, the five-storey Stembrook Mill, built to provide flour during the Napoleonic Wars, was demolished. The remains of its wheel pit can still be seen below Castle Street bridge. 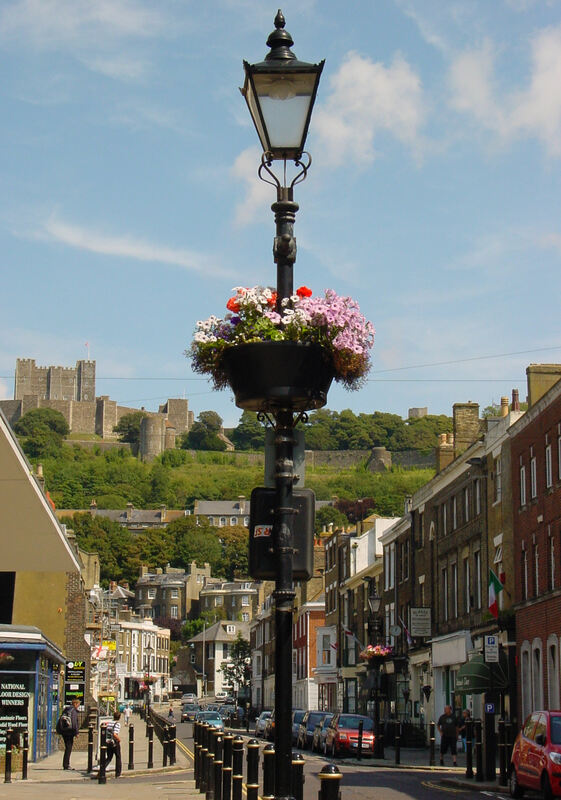 Dover’s first traffic lights, costing £342, were installed at the Castle Street /Maison Dieu Road cross roads in 1932. Seven years earlier, in 1925, following an accident on Castle Hill, it was decided to demolish numbers 2, 4 and 6 Castle Street but disagreements delayed proceedings until 1935. 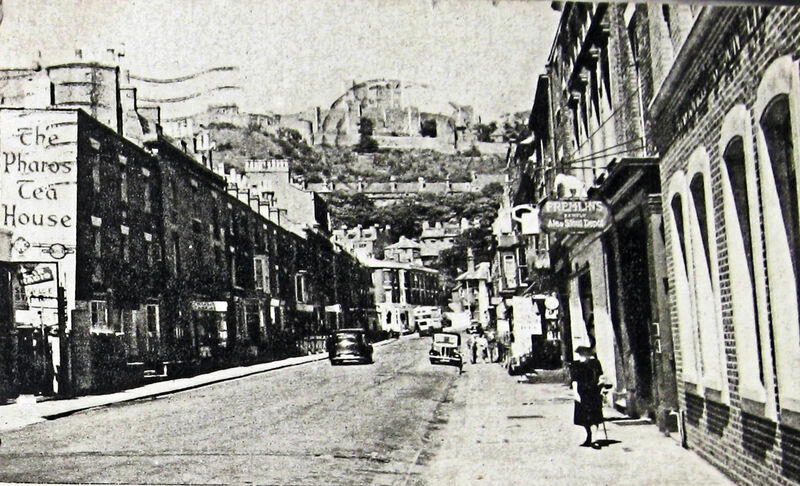 Although the road up the hill was then widened, there was a call for numbers 1, 3 and 5 to be demolished in order to straighten Castle Street to Castle Hill Road but was never put into practice. 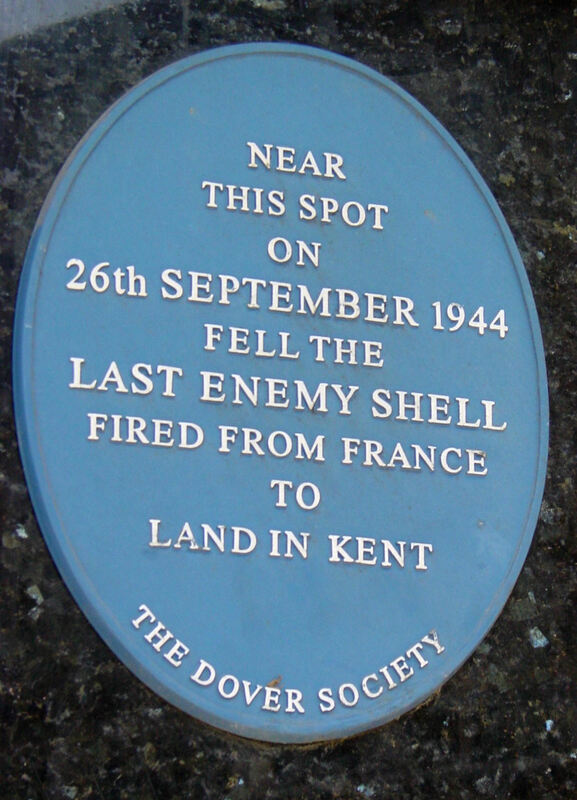 Dover Society Plaque Castle Street Last Enemy shell WWII. The bombardment of Dover during World War II (1939-1945) gave rise to the town’s nickname, ‘Hell Fire Corner’. The barrage ended on Tuesday 26 September 1944 at 19.15hrs when the last shell, to do any material damage, hit Dover, destroying Hubbard’s Umbrella Shop in Castle Street – A Dover Society Plaque marks the area where the shop stood. This was on what is now Castle Street / Church Street corner where work started, in 1955, on the largest building project the post-war Dover Corporation had, up to that time, undertaken. The £80,000 contract was to build the thirty-four Stembrook Court flats, a public house and two car showrooms. During sewage work, Roman remains were found, so the pub was subsequently named the Roman Quay and opened on 31 July 1957. Nearby, on part of Pencester Gardens, the Stembrook car park was built. This was the first car park in Dover to have parking metres, they were introduced in 1968 to stop local garage firms monopolising the car park. In April 1951, a building licence was successfully obtained by Folkestone Motor Company to redevelop 54-56 Castle Street and the following year Kenex Coachworks Ltd, an associated company, moved in. In the early hours of 27 June 1955, fire broke out and virtually gutted the building. Although a complete renovation took place, but three years later Kenex moved to Coombe Valley Road. Other changes at that time included cinemas. During the 1960s, some were converted to bingo halls while others were demolished, in Castle Street, the ABC, the former Granada cinema hung on until 31 October 1982 and was the last one to close. Leney’s bottling plant closed down in October 1952 and seven years later, in 1959, the old brewery’s chimney, near to Market Square, was demolished. The following February, after nearly fifty years of operation in Dover, the table water premises in Russell Street closed. However, in 1957 Russell Street thoroughfare was opened through to a widened Townwall Street. Permission was also given for £11,000 offices for the Automobile Association (AA) on the corner and these were brought into operation in October 1964. Townsend Thorensen car ferry company took over the AA building and retained the offices after they moved into their purpose built headquarters in Channel View Road in 1983. Eventually, this was taken over by P&O Ferries, who subsequently closed the Russell Street offices. Nearby, Southern Television leased land from the council to open a studio in the town. In April 1960, the Company started broadcasting from their new Dover studio but ceased on New Years day 1982. They had lost the franchise to Television South (TVS) who used the studio until their purpose built complex opened at Vinters Park, Maidstone in 1983. The old studios were taken over by printing firm AR Adams and Sons, established in 1888. However, not long after Dover District Council (DDC) voted to build a multi-storey car park on the site – they were heavily involved in a tourism that centred on the £13.25m animatronics White Cliffs Experience, in the Market Square. This was expected to be a catalyst that would bring tourist flocking to Dover and thus the need for car parks. DDC leased the derelict Townsend shipping company’s computer offices in Dour Street to the printing firm – who made a brilliant refurbishment job – and demolished their former premises. The catalyst was not as successful as had been hoped so the multi-storey car park was not built – the land is now an ordinary car park. 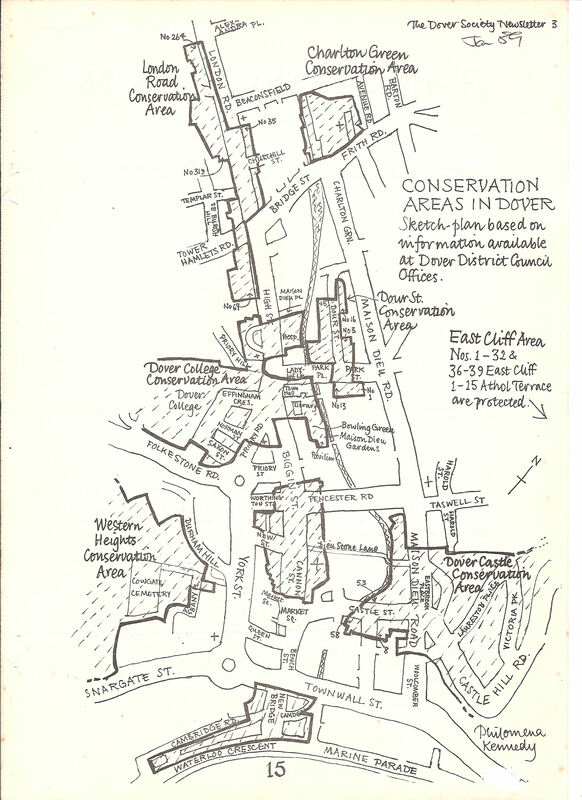 Map showing Conservation Areas 1989. Dover Society . Flashman’s, once the provider of furniture to the Royalty, on the corner of Castle Street and Market Square closed and the building was demolished in 1964 along with the adjacent Antwerp garage. The developers proposed to build a two-storey department store with a 12-storey block of flats above. Nearby, on the cleared Leney’s Phoenix brewery site, a bowling alley was to be built. In the event three-storey flats were built with a supermarket on the ground floor but the bowling alley never materialised. At the time Kent County Council were becoming increasingly concerned that much of old Dover, still standing following the War, was succumbing to demolition in the name of progress. 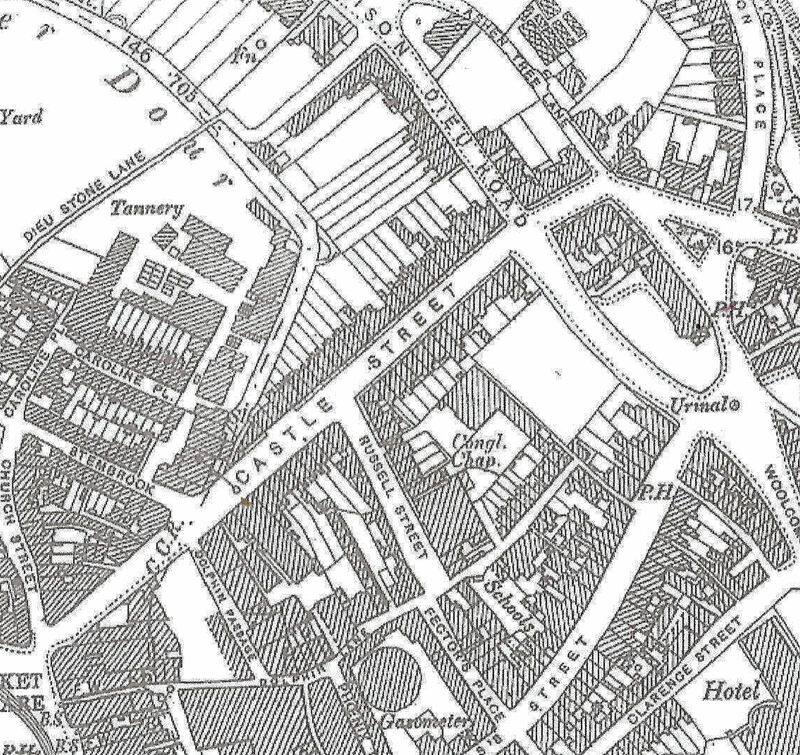 In 1970, they designated large areas of the town as conservation areas one of which centred on Castle Street. On a site previously occupied by Southern Auto’s, on the corner of Maison Dieu Road and Castle Street, a large MFI furniture chain store opened in 1981. The side facing Castle Street was specially designed to give the illusion of a door and windows conforming to the Street’s architecture and in line with the Conservation area status. In 1999, the owners of MFI wanted to relocate to the White Cliffs Business Park at Whitfield but DDC refused planning permission. The store closed and the Lidl discount food chain bought the property. However, they allowed it to fall into disrepair and twelve years later, it was demolished. The car showrooms, within the Stembrook complex, were taken over by the Trustee Savings bank next door, for its area director’s staff in 1991. However, they did not stay long and the empty building was taken over by the IMPACT Team – a joint initiative by Kent County Council (KCC) and Dover District Council (DDC), to improve several parts of Dover. It was through IMPACT that the Town Centre Management Company Ltd (TCM) was set up with the remit, ‘to ensure that the town became a thriving community with profitable businesses, where residents are happy to shop and relax and a place that visitors would return.‘ In 1996, on the town receiving Parish status, the Dover Town Council occupied the building before moving to Maison Dieu House. 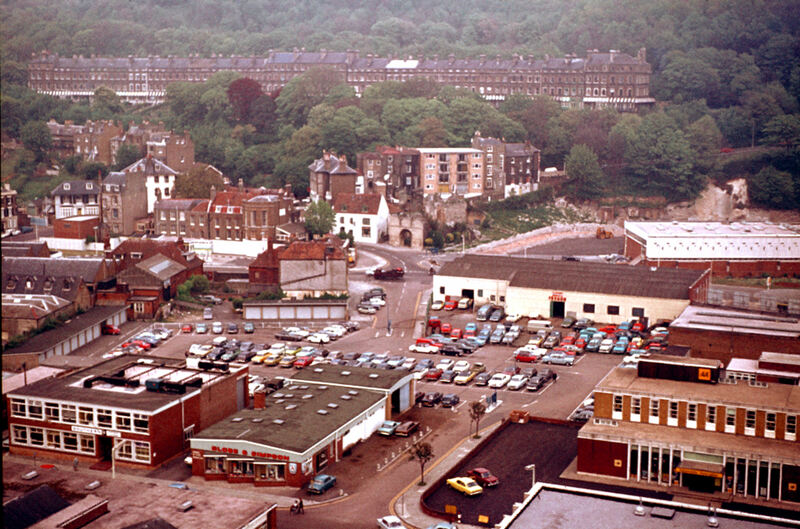 In 1997, the Russell Street site was identified as part of a redevelopment programme including a superstore, retail outlets, restaurants, a 100-bedroom hotel, 53 affordable homes and 600-space car park. The final go-ahead was given in 2007 and included the demolition of the rogue office block, Burlington House on Townwall Street, but ASDA, who were to build the anchor superstore, pulled out in 2010. Burlington House was eventually demolished in 2016. Opposite the Russell Street car park is the ancient Castle Inn owned by former News of the World journalist, Paul McMullan. He was a witness at the Leveson Inquiry into the culture, practices and ethics of the British Press. During the hearing, McMullan was one of only a few journalists to claim that phone hacking was rife at the newspaper. His evidence had a positive effect on Dover’s economy as journalists flooded in and used hostelries to replenish their thirst in more ways than one! 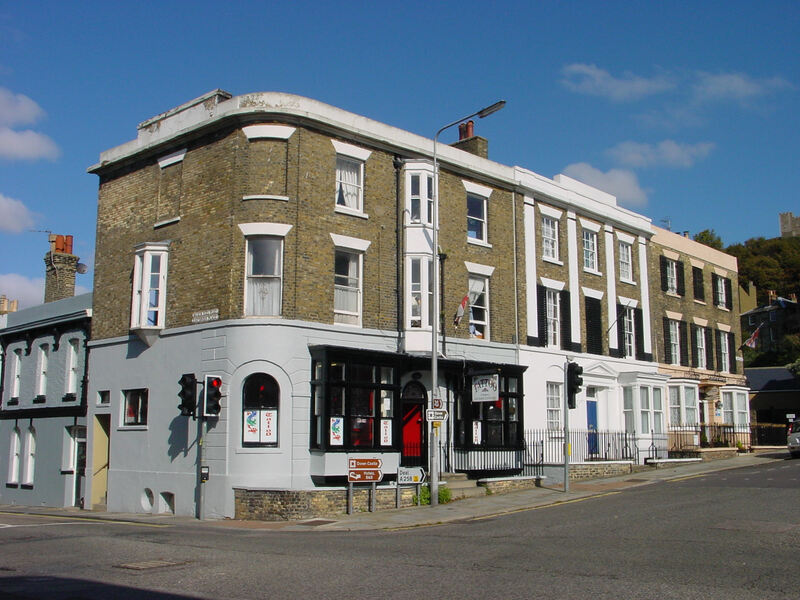 The Castle Street Area Society was founded in 1988 and that year realised the promise of an upgrade by DDC that included Castle Street, Castle Hill Road, Eastbrook Place and Laureston Place. Work started in 1990 by Walker Brothers Civil Engineers and cost £144,107.62p. Decorative bollards, bearing the old Corporation’s Leopards and DDC’s arms, line the street and are a decorative way of stopping traffic parking on pavements. ‘Windsor’ Victorian style street lighting was installed and the decorative coalhole covers, along with the boot scrapers and the fancy door fanlights, most of which date from when the Street was built, improved the ambience of the area considerably. Since then, in the summer, the Society hang flower baskets from the lampposts and at Christmas time, Burnham House Veterinary Surgery puts on a spectacular show using fairy lights. This entry was posted in Castle Street and Russell Street, Roads & Streets. Bookmark the permalink.